Pastor Jack M. Horner, D.Min. Jack Horner remembers finding a little red prayer book when he was eight or nine. It was in his grandfather’s basement, and something about that book gave Jack pause. Maybe it was the fact that it fit so perfectly in the palm of his hand. Maybe it was the distinctive old-book smell that appealed to the studious youngster. But he found inspiration in the prayers he read. Jack was hooked. Jack’s family did not attend church regularly at the time, but eventually he found his growing faith nurtured in a central Pennsylvania congregation. In that gathering of people, he learned about the means of grace. He found support and comfort in the rhythm of church life centered around forgiveness, song, prayer, holy story, creed, meal, and blessing. In time, Jack felt the urging of God to serve the church in ordained ministry. He attended Wittenberg University, a Lutheran college in Ohio, and returned to central Pennsylvania to Gettysburg Seminary. His internship in inner-city Pittsburgh taught him invaluable lessons in parish-based ministry, evangelism, youth ministry, and community outreach. In 1991, Pastor Jack was called to urban ministry at a congregation in Queens, NY, where he ministered door-to-door, started a Christian nursery school, a Latino ministry, and a summer youth program. In 1999, he led a congregation in Mount Kisco, NY, starting a contemporary service, a Christian nursery school, and an interfaith homeless ministry. 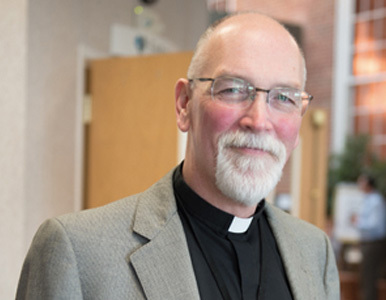 He also earned his Doctor of Ministry degree during this time, writing a dissertation entitled “Developing Missional Identity through Small Group Spiritual Formation.” In 2009, he joined the Metropolitan New York Synod as Director of Evangelical Mission. In April 2013, Pastor Jack was called to be Trinity’s lead pastor; he began his ministry here that June. Pastor Jack is passionate for the gospel and believes the Church is the hope for the world. He and his wife, Linda, have four children: Genesis, Joshua, John, and Krista. They are a pet-friendly household and enjoy sports and the outdoors. And anyone who meets Pastor Jack learns quickly that he is an enthusiastic Pittsburgh Steelers fan. Pastor John H. Brock, M.Div. Pastor John Brock has been part of Trinity’s life since 2002. A native of the Midwest, he lived in many different parts of our country before coming to Pennsylvania. While many people felt he had a gift for ordained ministry, John shied away from seminary and focused instead on youth ministry. He was a youth director in Connecticut, and certified as an ELCA Associate in Ministry, when he met another youth director named Marianne. Marianne saw in John the same gift for ordination that others had seen. But he still wasn’t sure. In 1992, Marianne gave birth to their first son, Noah, 15 weeks early. The baby survived just 36 hours. Losing Noah hit John and Marianne hard. Yet when John found himself able to comfort the many people who reached out to comfort him, something crystallized. It was time to heed what others encouraged him to do. The final push to seminary came from Ted W., a New England Synod leader and a corporate executive with vast experience in developing people. 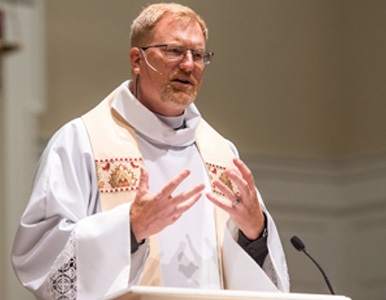 Pastor John was ordained in 1997 after graduating from the Lutheran Theological Seminary in Gettysburg. His first call was in Elysburg, Pa., followed by his call to Trinity as Associate Pastor. John and Marianne went on to have two more sons, Benjamin and Evan. Marianne is an ELCA Deaconess and Director of Camp Nawakwa, part of the Lutheran Camping Corporation of Central Pennsylvania. The Brocks live in a 200-year-old house with two large, friendly dogs and one small, tolerated cat. 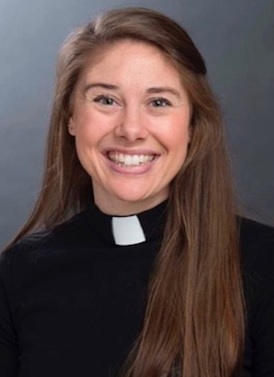 Pastor Elizabeth (Liz) Frey grew up in Millersville, PA, but attended a Lutheran church in Lancaster, PA. Growing up in a “church family,” the Frey’s attended church every Sunday and were involved in many of the ministries of the church. Pastor Liz looks back at that time as foundational to her call to ministry. Her parents were – and continue to be – profound Christian role models in her life. She attended Gettysburg College where she studied political science and religion and graduated in 2011. Upon graduation, Pastor Liz participated in the Young Adults in Global Mission program (YAGM), a Global Mission ministry of the ELCA. She lived in Malaysia from August 2011-July 2012, where she taught English at a seminary in the city of Kota Kinabalu. While in Malaysia, Pastor Liz experienced the abounding grace of God in amazing ways, and it was during this year of service that the Holy Spirit started nudging Pastor Liz toward a call to ministry. In the fall of 2014, Pastor Liz started seminary at the Lutheran School of Theology at Chicago. During seminary, she served congregations in Chicago and Billings, MT as well as a senior living facility as a chaplain. Pastor Liz’s passion for ministry grows out of relationships – getting know people and hearing their stories. In her spare time, Pastor Liz loves to stay active, particularly running and swimming. She’s an avid reader, who loves the Harry Potter series. Pastor Liz also loves elephants and cheering for the Philadelphia Eagles.